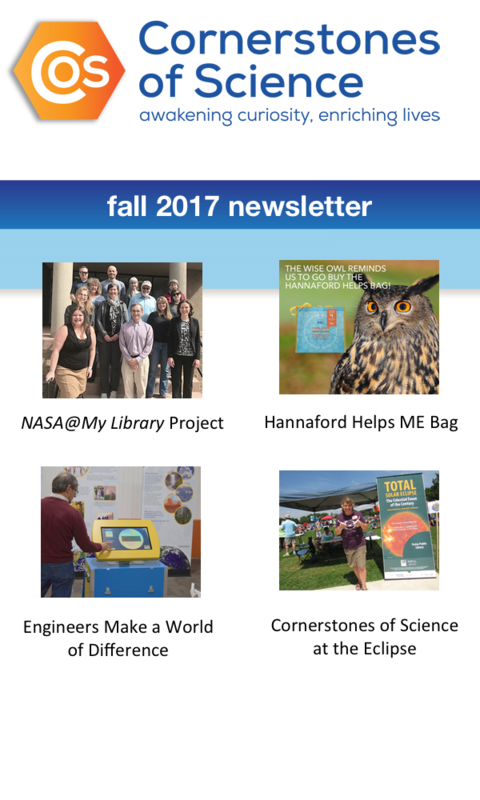 Cornerstones of Science would like to bring to the attention of all public libraries The STAR Library Education Network (STAR_Net), a national program led by the Space Science Institute’s National Center for Interactive Learning. STAR stands for Science-Technology Activities and Resources (not to be confused with Cornerstones’ own STAR telescope program). STAR_Net education programs were created to inspire lifelong learning through inquiry and play. The project has developed two interactive traveling exhibits (Discover Earth: A Century of Change and Discover Tech: Engineers Make a World of Difference), coupled with a variety of education and outreach programs. This additional programming includes hands-on activities related to the content of the exhibits for different age groups. The project includes a training program for librarians, a comprehensive outreach program for classroom teachers and out-of-school instructors, and an Online Community of librarians and STEM (science, technology, engineering, and math) professionals — currently, over 400 members nationwide. Core partners include the American Library Association, Lunar and Planetary Institute, and the National Girls Collaborative Project. Other partners include the Afterschool Alliance, National Academy of Engineering, Engineers Without Borders-USA, IEEE-USA, the National Renewable Energy Lab, American Geophysical Union, Geological Society of America, LEGO, and many more. Phase 1 of the STAR_Net project is supported through a grant from the National Science Foundation.